Medieval Cooking Tripods are heavy duty for holding small, medium or large cast iron cooking pots. 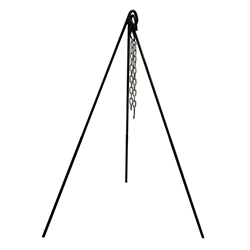 These iron tripods are a perfect accessory for our Medieval Cooking pots designed for medieval period cooking. Legs can also stand on a firm flat surface. Tripod Legs fold inward together for easy transport.